It was one product that drove Apple to its trillion dollar valuation. On the Tech Tent podcast this week, we ask whether the iPhone can continue to be the amazing profit engine that sends the company's value soaring. When Steve Jobs climbed on stage in San Francisco in January 2007 and said "we're going to make some history today", he had already turned Apple around. That is why the company had the confidence to believe it could transform a whole new industry. As Jobs unveiled the iPhone, Apple's market capitalisation hovered around the $100m (£77m) mark. 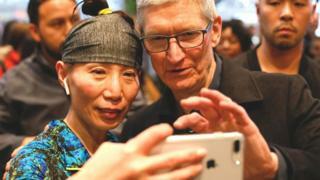 As it surged towards the trillion dollar benchmark, there were a few hiccups since - just about all of them sparked by fears that the iPhone's best days might be behind it. But Tuesday's third quarter results convinced the market that there were plenty more profits to come, giving the share price the final push over the line. There had been fears that the eye-watering price of the iPhone X might be a step too far for many people - but enough are taking the plunge to keep the outlook rosy. What an irony then, that at the moment of its triumph Apple should be demoted to number three in the global smartphone market. China's Huawei has leapfrogged into second place, buoyed by huge sales in its home market. Number one is still Samsung, though this week the South Korean giant admitted that sales of its flagship Galaxy S9 smartphone had proved disappointing. Nearly six years ago, I visited Huawei's Shenzhen headquarters to report on its massive investment in research and development. I was somewhat amazed when an executive told me the company's ambition was to be in the top three global phone-makers - and potentially get to number one. But Huawei's sheer financial firepower - coupled with some high-quality products - has propelled it to number two. Samsung must be looking nervously over its shoulder. But should Apple be worried? Probably not in the short term. Its average selling price and its profit margins are way higher than any of its rivals can manage. It has pulled off the trick of being both a luxury and mass market brand, and the loyalty of its fans seems unshakeable. Time and again, Apple has been warned that it could suffer the same fate it dished out to Nokia and BlackBerry. So far, it has proved the doubters wrong - but maybe one day another inspirational tech leader will climb on a stage and unveil something that will make the iPhone obsolete.